Please Note that this was a 1931 reprint of a 1904 article. The material is for historical reference only, 60 years on the sect appears all but gone. The following article was contributed to "The National Review" in Sept., 1904, by Earl Winterton, then Viscount Tumour. The Editor of the S.C.M. is indebted to the author, and Mr Leo Maxse, Editor of " The National Review," for their kind permission to reprint it. Although the article was written 27 years ago it is equally interesting today. where they have earned the respect of the community. In a corner of the Weald of Sussex, due north of Petworth, lies a quiet woodland district, A whose inhabitants pursue their vocation of farm work in summer and copse-cutting in winter, from year's end to year's end, untroubled by railways or the big military camps and red­brick villas, not so many miles away over the Surrey border. It is in this district, which may be said, roughly speaking, to comprise the parishes of Wisborough, Northchapel, Kirdford and Lurgashall, that the little-known sect, which is the subject of this article, has its headquarters: a sect, of which probably not more than a hundred people outside its immediate neighbourhood have ever heard, but which, nevertheless, presents many points of interest, both in its constitution and history. 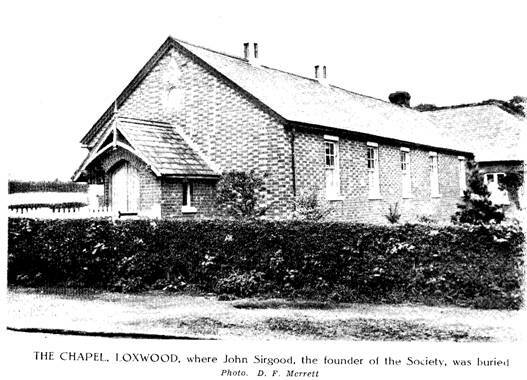 In 1850, a London shoemaker, by name John Sirgood, came to live at Loxwood, a small village in the parish of Wisborough, and soon after his arrival there started a little religious clique of four or five persons, who met together in his cottage every Sunday and probably on certain week days as well, to hold a service of their own under the guidance of Sirgood. 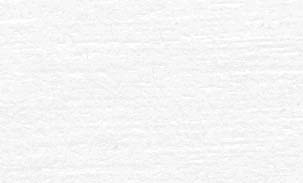 Mr Sirgood.-Sir, I went to your house on Thursday evening for the purpose of giving you the enclosed notice, but found you holding one of your unlawful meetings. I am glad 1 did this because I have now myself witnessed two of these unlawful assemblies there, and could with out difficulty procure your conviction in two penalties and these two could probably be easily multiplied. It is a very general opinion that your illegal proceedings have been allowed to go far enough, and that it is quite time they should be controlled. This bellicose letter was followed by a mass of correspondence from both sides, but no action was taken by the parish authorities, and soon afterwards the repeal of the Conventicle Act left the sect free to worship as they pleased. Meanwhile Sirgood was establishing branches of the sect in the neighbouring villages, and in more distant places. A community was established at Shamley Green, near Guildford, in 1855, while early in the 'sixties a chapel and burial-ground was acquired at the headquarters in Loxwood. The Society of Dependents or Cokelers (as Sirgood's following were called) established communities also at Northchapel (about 1870), Warnham (in 1876), Kirdford, Upper Norwood, Chichester, and possibly one or two other places which Sirgood visited. In several of these places, notably at Warnham, Loxwood, and Northchapel, contemporaneous with the establishment of a chapel was the building of a sort of store; the joint property of the local members of the sect, which provided for their wants, and also for such members of the outside public as might choose to patronise it. It is probable that Sirgood, who had socialistic tendencies, favoured the setting up of stores which should render his flock commercially self­sufficient. In 1885 Sirgood died and was buried at Loxwood. At the time of his death he must have had nearly 2,000 people under his influence, and he had lived long enough to see his following, at first consisting only of three or four people jeered at by their fellow villagers, grow into a prosperous community, owning their own chapels and stores, and respected by all. As I mentioned before, the sect have always been known as Cokelers, although they call themselves the "Society of Dependents." The origin of the name Cokeler is somewhat difficult to explain. It is undoubtedly a nick-name of some sort, but this very fact increases the difficulty, for the Cokelers, though ready enough to discuss other matters, are very reticent when any question is asked about themselves. The name Cokeler has been applied to them for fifty years since the foundation of the sect, and is thought by some to have reference to their temperance habits and consumption of cocoa. It is certainly an ingenious theory, and the one usually given locally. 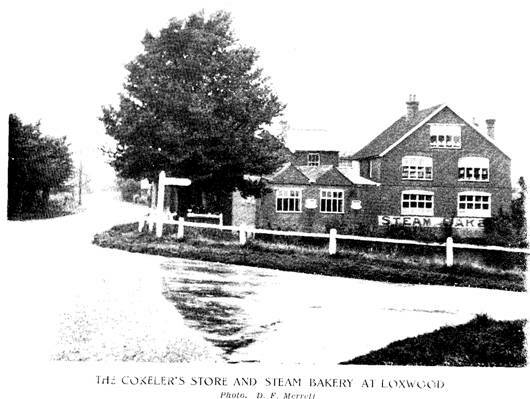 It is a curious coincidence that there was formerly a part of Loxwood known as "Cokkeg," but the name does not seem to have been used for over a hundred years. An old man, whom I questioned on the subject, had never heard of the name, though, he remembered perfectly as a boy the time when Sirgood's following first began to attract attention. " They used to call 'em Coklers; I never heard why." It is a most remarkable thing that no one can satisfactorily explain the origin of a name only fifty years old. Blunt, who, in his Dictionary of Sects, devotes a short paragraph to the Cokelers (which by the way he spells "Coglers "), says, "They are said to have a book of Cople, probably in imitation the Mormons." Blunt gives no authority for this statement and the most careful research on the part of gentleman who lives near Loxwood, and who has for twenty years interested himself in the sect has failed to disclose the existence of this book of Cople. Possibly, however, Sirgood did give out that he had received direct inspiration from heaven, but my own opinion is that the name dates from some obscure Sussex joke, long lost. in the mists of the past. The creed of the Cokelers is of a pronounced Antinominian type, built up upon a number texts, taken out of their context, and thus rendered capable of any interpretation they may put on them. In each chapel there are certain elders or "stalwarts" chosen from the congregation, who no doubt manage the affairs of the chapel, but of ministers, in the generally accepted sense of the word, they have none. The reading and committal to memory of large portions of scripture form a considerable part of their service, at the end of which each member in turn, as the Spirit moves him, gets up and preaches. They differ from almost every other Christian sect, in that they do not use the Lord's Prayer, asserting that the Lord's Prayer was given merely as a model for other prayers, and that its very brevity proves its unadaptability for use. Besides the services on Sundays, oncertain week-day evenings, generally twice a week, the congregation meet together at certain of their chapels. For this purpose Cokelers will come great distances, and it must be somewhat of a shock to a stranger, walking on a summer's evening in a quiet Sussex lane, suddenly to come upon twenty or thirty of these people driving in wagons to their chapel, and chanting a sort of psalm, all the men being dressed in dark clothes, and all the women in black dresses with poke bonnets, somewhat similar to those worn by the Salvation Army lassies. Total abstinence is no longer, as it was formerly, insisted on among the Cokelers, but it is encouraged, and I fancy very few of the Cokelers touch intoxicating liquor. On the subject of marriage they entertain peculiar views. They have no marriage service, and, while recognising the necessity of marriage generally, they do not encourage their members to marry. This extraordinary attitude, justified neither by expediency or common sense, would seem to be a direct incentive to immorality, but to the credit of individual Cokelers be it said, it is seldom acted upon. The position taken up by the elders is that while marriage is a thing to be, if possible, avoided and an evil, yet any infringement of the laws of morality is a far graver evil, so that they do not taboo married persons joining the sect, or even Cokelers being married before a registrar or at the parish church. They simply say that in their opinion both man and woman are the better for remaining single, and that those who wish to lead a higher life should not need such earthly institu­tions as marriage. In practice, however, the sect do not follow their own tenets; indeed, if they did, it is difficult to see how they would survive in the course of time. These narrow-minded puritanical views, peculiar to any sect composed almost exclusively of country people, in the main ignorant and untaught, are seen in other directions. They abjure the most harmless pleasures, such as dancing, music, except of a religious nature, and flowers in a room. Indeed, they will seldom join in merry-making of any kind. Yet on the whole I do not think that hypocrisy can be urged against them. Their Sunday and week day services are attended by practically the whole sect, and no consideration appears to weigh with them in the performance of their devotions. Even on Bank Holidays, days it is to be feared associated with anything but church­going, Cokelers spend a considerable part of the day in their chapels, and, indeed, all the holidays they take appear to be spent in this way. Nor do they fail to live up to the standard they have set themselves, for a more honest, industrious. and clean-living set of people it would be hard to find, and one cannot but feel admiration for them as citizens, even if one pities the narrow­ness and bigotry of their views. The vicars of those parishes which contain Cokelers are almost unanimous in their praise of the sect, and on all sides it is evident that the old antipathy to them his disappeared. They live peaceably and on terms of friendship with their neighbours of other denominations, and the days when they were subjected to "rough music" and other petty persecutions at the hands of village roughs have long passed. The largest distribution of Cokelers at the present day is in the parishes of Wisborough, Kirdford, and Northchapel. Roughly speaking, the Cokelers form a third of the total population in Wisborough and Northchapel, while there are also a good number of Cokelers in Kirdford parish, though they are principally confined to the village of Plaistow in the north of this large and thinly populated parish. They have quite recently built a chapel there. At Shamley Green and Warnham there are communities. and at one or two other places, but the sect has not increased, but rather decreased of late years, and I should not think they number much more than 900 all told. Unlike certain other nonconformist organisations, the Cokelers have never utilised their numerical strength for political ends. One instance did occur some time ago of the Cokelers voting "solid." The squire of a certain parish and a farmer were standing for the County Council, and for some reason or other the latter who lived in the south of the parish was believed to be opposed to the macadamising of muddy lane in the north of the parish, which however little it concerned him, was a matter of some moment to the local Cokelers, as the lane formed the only means of communication between two Cokeler chapels, which were some miles apart. Nearly every Cokeler gave his vote against the farmer, who in reality was innocent of any feeling of opposition to a much-needed improvement. As was mentioned early in this article, the sect have possessed stores from quite early in their history, and the extent to which they have increased their business is a considerable proof of energy and business aptitude. They have stores at Norwood, Warnham, Shamley Green, Loxwood and Northchapel, and from being merely small shops to enable the brethren to keep their money within the fold, have developed into big dry-stores, and have, to use a Yankeeism, "hogged" the whole trade of the place. Take Northchapel, for example. Northchapel is a small village, six miles from a rail­way station, with a parish population of only 700, and yet the village contains a Cokeler store, consisting of three departments, and employing thirteen saleswomen and assistants, besides delivery carts and their drivers, etc. Naturally with a store of that size, selling every requisite for a country village, there is not much room for any other enterprise. It seems strangely incongruous in this little old-world village, which has not witnessed the erection of more than two new houses in a quarter of a century, to see an arrogant, red-brick emporium with plate-glass windows, flanked on one side by the Cokeler meeting-house, on the other by their steam mill. The Cokelers have another store at Loxwood which is a very little bigger place than Northchapel. Here in addition to selling provisions, haberdashery, china, clothes, etc., they even deal in bicycles, gramophones, and motor accessories. Indeed a motor is let out for hire, and I believe if one wanted to, one could buy a motor through the store. 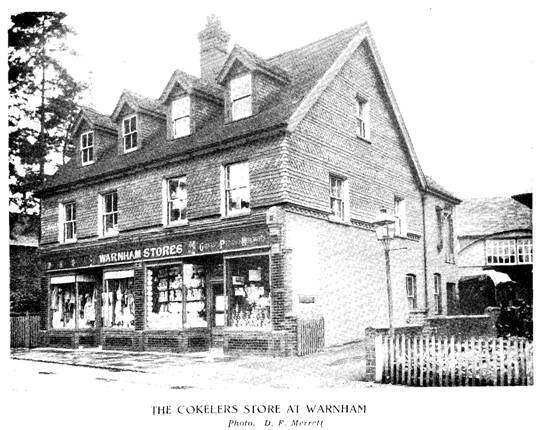 At Warn­ham, twenty-eight years ago, the Cokeler store employed three women and two men; it now employs thirty-one of both sexes. The business of these stores is conducted by a secretary and four trustees, and every member of the sect can be a shareholder. A very large number of Cokelers do invest their savings in the store, which explains the reason why the labouring class among the Cokelers arc so much better off comparatively than those of other denominations. Hardly anything goes to the public-houses, and every shilling a week saved goes to the store. The stores undoubtedly pay big dividends, and should that part of Sussex, where the Cokeler headquarters are, ever become a residential neighbourhood, like most parts of Surrey, their profits would be considerably swelled. Another point which should not be lost sight of is the connection between the Cokelers and agricultural co-operation. It is a matter of common knowledge that for years successive Ministers of Agriculture and others have endeavoured to improve the position of the British farmer by encouraging co-operation and a system by which British produce could reach the consumer directly without the medium of the middleman. In a small way, certainly, but nevertheless successfully, the Cokelers have solved this great question. In other directions agricultural co-operation has almost invariably broken down, partly from the want of business habits and partly from the jealousy of farmers, for farming is, unfortunately, like horse-dealing, a trade in which going one better than one's neighbour is considered the criterion of success. The Cokeler farmers sell their butter, milk, bacon, eggs, etc., at their local stores, a state of affairs which one may call "Free Trade within the Empire," since not only do the Cokelers themselves supply the stores with provisions to sell, but they obtain nearly all their necessaries of life from the same source, while all the time the outside public is buying largely from them and selling nothing in return, at least not from the neighbourhood. The Cokelers are, at the best, a small and insignificant sect, so far as numbers go, but there is no doubt that if this system of stores could be instituted in England generally, especially in the neighbourhood of towns, the position of the farming interest would be immensely improved. With the exception of bad prices and scarce labour, agricultural authorities seem to be agreed that want of cohesion and commercial acumen, taken in con­junction with high railway rates, have done more than anything to ruin farming in this country. Apart from the fact that Cokelers have made their farming as successful as it is possible to be, as conditions are at present, they are always sought for as tenants, as they are known to help one another, both with labour and money in times of trouble. They have always the stores to lend them money. Cokelers, too, are naturally steady and industrious, and have few amusements to distract them from work. It is difficult, at present, to foresee what is going to be the future of this strange little sect, this association for mutual assistance in religion, agriculture, and commerce. Commerce and religion have never gone well together, and there is no reason to suppose it will do so for long in the present instance. As yet, certainly, there is no sign of rupture, and the Cokelers still continue to be a stern, puritanical sect, but I doubt if it will continue for long, as I am told that the stores are beginning to make alarmingly large profits, and it must be a temptation to the outside public to join them merely in order to a safe investment for their savings. It is certain that there is no other sect which offers such a tempting prospect, at any rate. Should the sect ever die out and the stores be handed over to a company. Sussex will be the poorer for the loss of a kindly and honest set of people. In reference to two articles in the magazine for November on "The Cokelers" and that on " The Surrey Sussex Glass Industry," the follow­ing may be of interest. On page '747 is a map showing the site of a glass house in Hogwood, at the bottom of same on the Plaistow-Loxwood Road is Hold Cottage. Now the occupants of that, the Misses Pacy, are the daughters of Peter Pacy, now deceased some 20 years, who was a disciple of John Sirgood. They could tell you as much as anyone of the origin and history of this sect. With regard to the name " Cokeler " old Peter Pacy told me himself that the origin of it was that of the theory given by Earl Winterton. When Sirgood used to preach in or outside of the village inns, the habitues, knowing him to be an abstainer would say " Have some beer?" His reply was always '' No, but I will have some cocoa." Cocoa it seems was little known in the country then and the name being a novelty he was nick­named and his following after him " The Cokeler" or cocoa-drinker. The sect used to have a small following in Brighton about 25 to 30 years ago. They used to meet at a little Mission Chapel at Hove. I believe it was the one at the west end of Conway Street. now occupied by the Salvation Army. Peter Pacy used to go "on circuit." and I remember his coming to preach there. 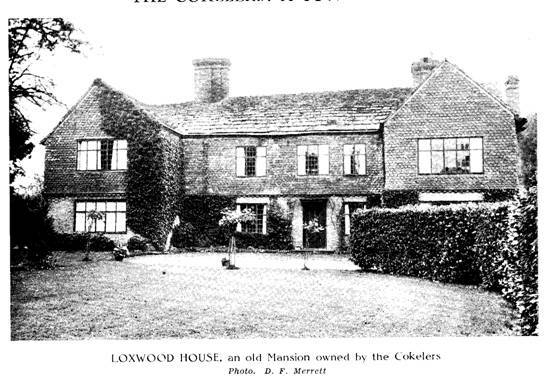 I believe the " Cokelers " now have in addition to the states at Loxwood, the farm " Plaistow Place." Reverting to the Pacy family, there is a legend in the family that they came from France. but they know no details. There is a town of that name in France-on the Eure about 60 miles S.E. of Paris. Some of the Christian names of the family point to that "Lois" (Eloise?) for one. They might have been Huguenot emigres, or possibly survivors or rather descendants of workers in the Glass Industry. They also say that at one time a lot of the country round belonged to the family and that some of them lived at Malham House (map ref. S.C.M., page 742). where. by the way, is also a Glass House site. I have never tried to verify any of the last paragraph. Referring to the article on the " Cokelers " in your last issue, I have gleaned the following local information. There is a fairly strong local section here with chapel and store. They were also known locally as "Ranters." but nevertheless are held in great respect, and the store has a reputation for good quality and low prices. The late Mr Michael Woolgar, a much-respected tradesman and imposing figure with a long white beard. was known locally as their " Bishop." For years a contingent from Felpham used to be brought to Chichester and returned by the local carrier; now they charter a bus every Sunday. Several "old-timers" from East Dean and surrounding villages used to get up early on Sundays, and, taking their food with them, walked to Chichester where they attended the Sunday services, and walked back. © 2002-2005 Martin B Snow all rights reserved. Web provision is for private study only.